Promotion in our Oakland office! 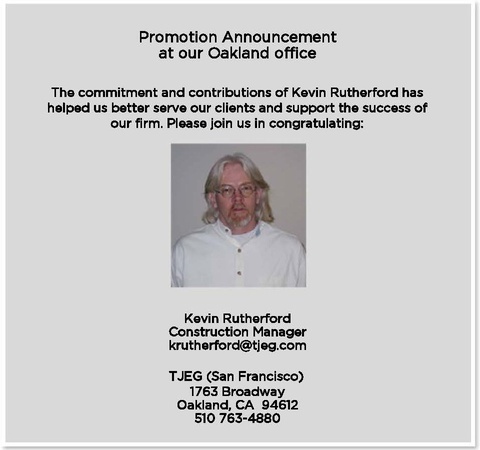 Congratulations to Kevin Rutherford on his promotion to Construction Manager at TJEG! Cost Estimator position opening at Ted Jacob Engineering! Ted Jacob Engineering Group is currently seeking a Cost Estimator to review blueprints and drawings, specifications, proposals and other documentation to prepare time, material costs and labor estimates for construction-related services to be performed. 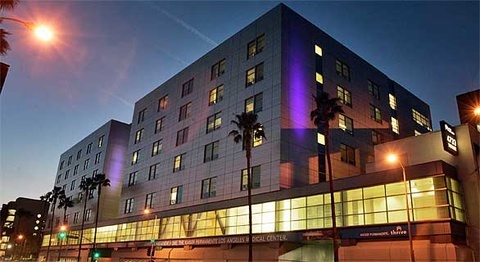 Interested applicants may contact us at 1763 Broadway, Oakland, CA 94612, Attention Human Resource Department. One of our projects in Dubai, the Serenia Residences in Palm Jumeirah, has been granted its building permit. 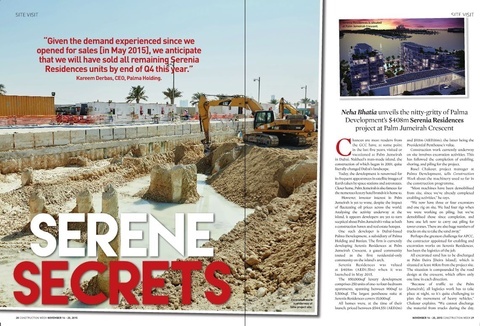 The project was featured on the cover of Construction Week Magazine. 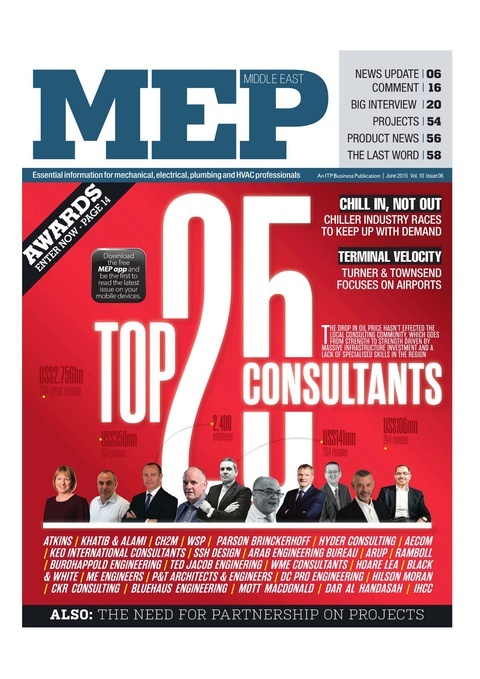 Ted Jacob Engineering Group occupies number 13 on the this year's Top 25 MEP Consultants. 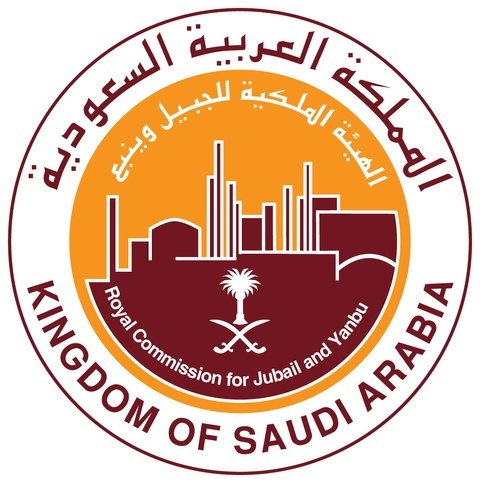 The list is published by MEP Middle East magazine, the region's most reputable MEP Magazine. Ted Jacob Engineering Group (TJEG) announces the appointment of Mr Aslam Dangra and Mr Ron Larsen as general managers for the Abu Dhabi (UAE) and Al Khobar (KSA) offices respectively. This expansion of the MENA region management team reflects TJEG’s commitment to its long term growth strategy on the Arabian Peninsula. 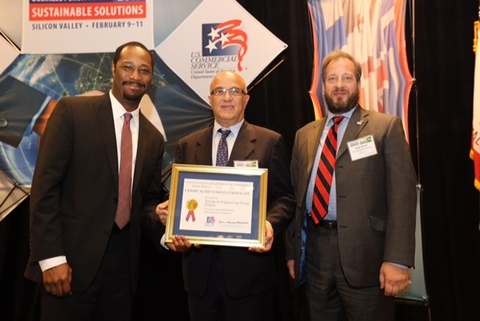 Ted Jacob received the Export Achievement Certificate from Antwaun Griffin, Deputy Assistant Secretary for US Operations, US Commercial Services/US Department of Commerce at the Sustainable Solutions Business Forum held in Silicon Valley. The Business Forum organized by the U.S. Commercial Service, in cooperation with NASA, "Discover Global Markets: Sustainable Solutions" addressed the link between sustainability and global business opportunities. The forum was attended by U.S. commercial diplomats serving in more than 20 markets across the globe, together with private sector thought leaders. They shared their insights, expertise and knowledge into international market trends. 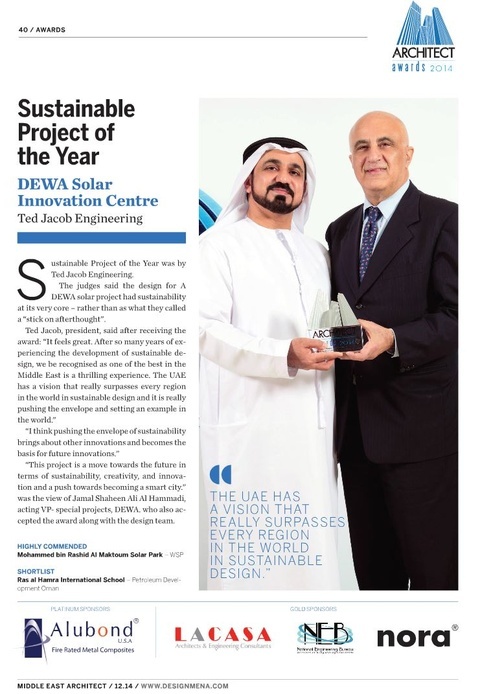 Our team has been awarded the Sustainable Project of the Year at the Middle East Architect Awards 2014. The DEWA Solar Innovation Center will be a science, convention and visitors center showcasing the Mohammed Bin Rashid Solar Park in Dubai. The Center will be a leading example of sustainable development supporting the use of renewable resources. Ted Jacob Engineering Group has been commissioned the project management and engineering design for this prestigious project. 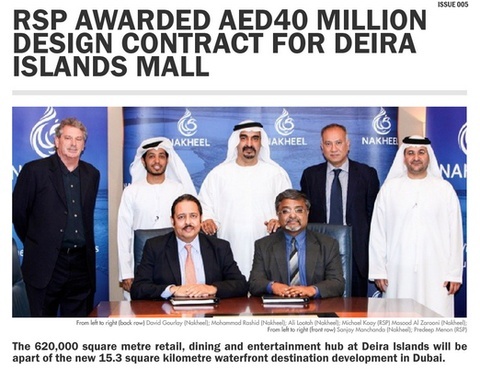 RSP has been awarded a contract for nearly AED40 million for the design and supervision of Deira Isalnds Mall, which will have over 200,000 sqm of leasable space, hundreds of shops, cinemas and a wide variety of cafes and restaurants. Partnering RSP on the project is the Dubai Branch of Ted Jacob Engineering Group who shall be providing and civil, structural, mechanical, electrical and plumbing services along with a number of other specialist engineering services. Work has already started on the conceptual studies and design.